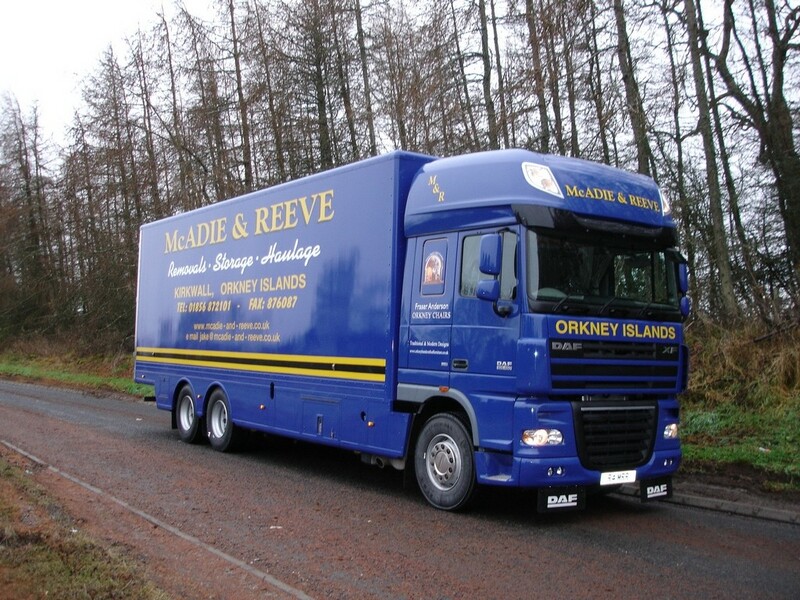 McAdie & Reeve, No 1 removal specialists. We encourage our customers to take the hassle out of moving by leaving it to the experts. We offer a full packing service, local or worldwide. We also do a great service in general and bulk haulage by getting that much wanted item home from anywhere in the UK. Weekly we collect from Ikea, Wickes, Homebase, etc as well as from our depots in Cumbernauld and Inverness. We are also the Shapinsay island haulier, and head out there at least 4 times every week. We have an 8 wheel tipper lorry for carting all your stone requirements, either phone Bruce on 07552 127629 or the office to discuss. New to McAdie & Reeve is a Wheelie Bin Washing Machine so they can now provide a Wheelie Bin Washing Service to all bin users. Keep your bins fresh with a 4 weekly wash at very reasonable rates. Give us a call to organise having your bins professional cleaned of nasty smells and bacteria. Storage is another part of our business, purpose built containers can be arranged on a weekly, monthly or yearly basis at a very reasonable cost.